One of the biggest concerns that users have about our device is the battery life . A component of our volatile device, which requires a load practically daily with an exhaustive use, or a little more with a moderate use. Like any component of our device-programmed obsolescence is called- with use begins to deteriorate , and after a while-about two years on average-we begin to notice how the capacity of our battery begins to fall, and our device Hold less and less time on. To avoid this as much as possible, Apple offers some advice on its official website , showing its users what measures they should take to prevent the battery from draining at a faster rate. But if still following these processes you do not find improvement, it is possible that you have to rethink replace the battery of our iPhone, iPad, iPod Touch or MacBook . How can we know if the battery life is at an end? 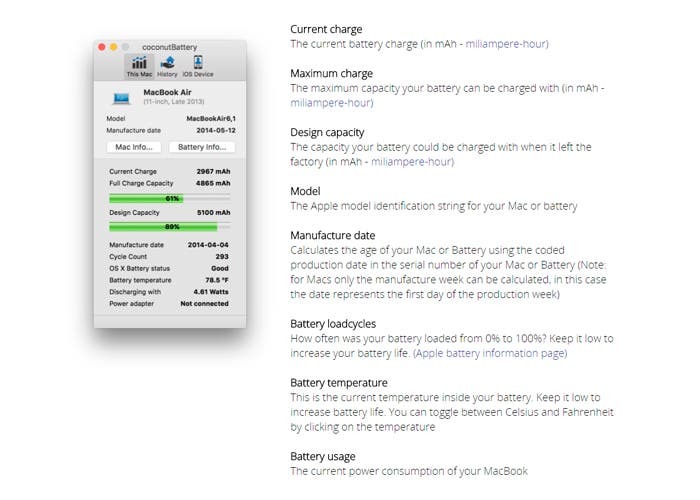 If you are the owner of a Californian signature computer, you can obtain a brief report on the battery status of your device with Coconut Battery . The current load of the device. The maximum design load capacity -the one that the battery allowed the first time it was used-. The current battery capacity is the one that really shows us the state of our battery. Date of creation of the unit . Date of creation of the battery . Exact model of the device. Once the application is downloaded and installed, it will be enough to run it to see the main window. It shows us the data related to the Mac in use . We connect our device to the Mac. We mark in our terminal the option to Trust the connection. 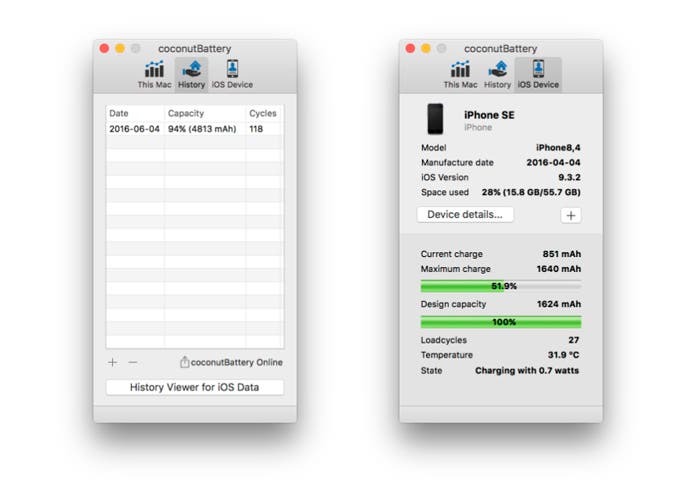 We wait a few seconds and then we mark the iOS Device tab that we can find in the upper right area of ​​the window generated by Coconut Battery . As soon as our terminal appears, we can see all the data discussed above and more . But how do I know if I need to change my device's battery? We must consider two factors. The first one is about the cycles it has. According to Apple , our iPhone, iPod and iPad should be at 80 percent capacity after completing 500, 400 and 1000 load cycles respectively . If this value is exceeded, we will have the first excuse to make the change. The second factor to consider and the most important is the capacity of the battery. In the window of Coconut Batery we are shown two small linear graphs: the first with the original capacity of the battery and the second with the current capacity. The percentage found in the second graph indicates the operating part of the battery . If this is less than 80 percent, it's time to start thinking about a possible substitution. In addition to seeing all records at the time, the application allows us to make a record of all the data collected every time we have connected our device and open the app. Coconut Battery is not infallible, but allows us to see more or less accurately, the state in which the battery of our device is located and if a replacement of it is necessary.